Shelter, along with food and clothing, is one of Man’s three most essential necessities. Shelter protects people from the weather, shields them against wild animals and insects, and provides a place to rest. The most common form of shelter would be that of housing, however shelter has evolved into many different forms, including (but not limited to) bomb shelters, bus shelters, tents, trailers and even houseboats. A cave formed within a mountainous rock. In the earliest prehistoric era, before Man knew how to build shelters, they made use of the natural environment to provide them with shelter. The earliest forms of shelter were those in trees, where it would provide minimal protection against the searing heat of the sun and the cold of the rain. Also, trees protected Man against animals that could not climb up the trees. Another natural form of shelter was the cave, which provided greater protection against inclement weather, though offering less protection against wild animals. The first man-made shelter was believed to have been made out of stones and tree branches. The stones were placed at the base of the structure to hold the branches in place. Man slowly learned the make simple tools that would allow them to build better structures, and later on these structures gradually evolved in shape and form. Other materials such as huge stone slabs, bones, and even animal hide were used to built the structures, which then provided much more stability, security and comfort. 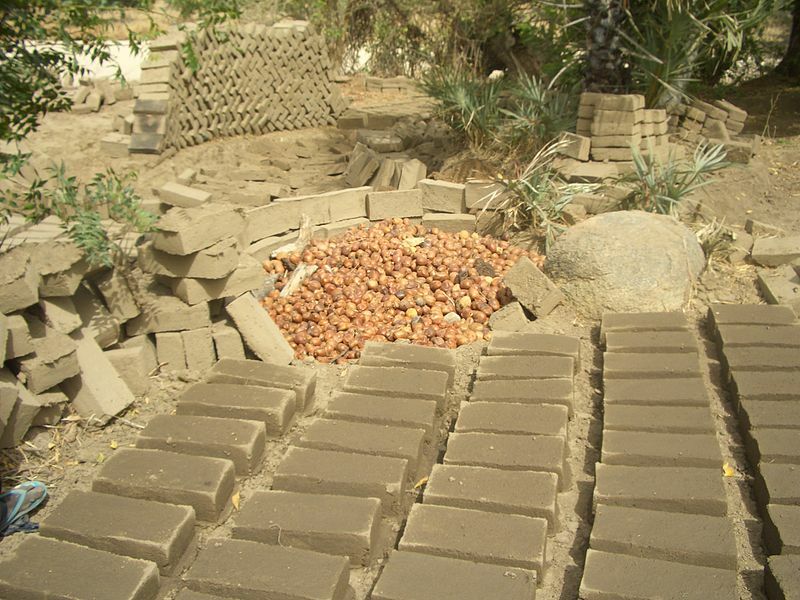 Eventually, earth was taken from the ground and dried in the sun to form clay blocks, leading to the usage of bricks as the basic building block of shelters. A shelter made from bones. The ancient Egyptians started building flat-topped houses made out of sun-dried bricks around 3100BC. The domestic dwellings of elite and ordinary Egyptians were constructed using perishable materials such as clay bricks and wood. Peasants lived in simple homes, while the palaces of the elite were more elaborate structures. Famous structures such as the pyramids and temples were built to emphasise the control and power of the Pharaoh. The idea of sun-dried bricks was improved upon by the Assyrians almost 600 years later, when they discovered that baking bricks in fire made them harder and more durable. They also started glazing bricks to strengthen them and improve their imperviousness to water, which was useful in times of storms. The ancient Greeks lived in well-made stone houses with slanted roofs that let snow and rain slide off. Most of the walls in Greek structures were built using sun-dried clay bricks or wooden framework filled with fibrous material such as straw or seaweed covered with clay or plaster. In addition to building houses, the Greeks built other forms of shelter such as temples and public buildings, which were dignified and gracious structures built to emphasise the cultural and economic prosperity of their society. Open-air theatres meant for public gatherings as well as cultural performances were also built, with some still standing today. The Romans improved upon the techniques of the Greeks, and introduced the concept of central heating to tide them thru cold weather. They laid rows of earthenware pipes under the roofs and floors and ran hot water or air through them to heat. Most houses were built around atriums, or a central court, with rooms off the court. The Songyue Pagoda, one of the few surviving sixth-century pagodas, was made of bricks. Ancient Chinese architecture is based upon three components: the foundation platform, the timber frame, and the decorative roof. In addition, the most fundamental feature of any ancient Chinese shelter would be that of a four-sided rectangular enclosure, with walls formed at right angles to one another. Similar to civilizations elsewhere, the Chinese used packed earth as well as sun-dried clay bricks in their construction of structures. These were typically used within wood frames and formed the foundation of the structure. The roofs and ceilings of the traditional Chinese were constructed without nails, only held together via layering the different pieces in interlocking bracket sets. From the Tang Dynasty (618 - 907 AD) onwards, the common use of wood in buildings was replaced by the use of stone and bricks. This ensured that the buildings or shelters would last longer and not be as vulnerable to weathering, fires and rotting. When the Roman Empire collapsed around AD400 and were overrun by Germans and Scandinavians, the improvements they made in building and construction of shelters were lost for several hundred years. Buildings built by Germans and Scandinavians were supported by frameworks of heavy timber or wood, and spaces between the wood were filled with clay. Some of these structures developed into fortified castles of the Middle Ages, with thick stonewalls, water filled moats, and drawbridges. Inside the walls, people built stables for horses, barracks for soldiers, shops for making tools and weapons, kitchens, dining halls, and even prisons for enemies captured in wartime. In the 15th century, Europeans began building half-timbered houses, with stone or brick foundations. Tree trunks are placed at corners of the houses, and strong wooden beams were used to support the house. Then they fastened crossbeams at the top and bottom of the beams and added slanting braces. They covered the walls with lath, or thin wooden strips, plastered with a mixture of clay and straw. The Early Modern Period encompasses the late Renaissance period as well as the Early Industrial Age. Many technological innovations took place in this period, some of which formed the foundation for building shelters in the modern day. Glass was used extensively in this period, and altered the facade and window construction details considerably. This technique was used mostly in the building of grand public structures. 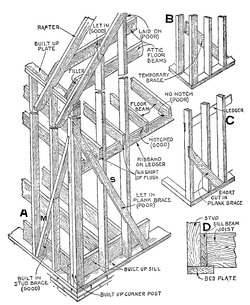 Construction in the Renaissance period also focused much on the design and architecture of the building, rather than the materials used for the construction process. This was largely due to the increased appreciation of aesthetics and design, as well as the emancipation of various other art forms, leading to widespread cultural reforms. The advent of the Early Industrial Period brought about mass production using existing technological processes, as well as an increase in the innovation of technology. The rate of building of shelters increased exponentially following the widespread use of the steam engine, and this allowed iron to be made easily at a large scale. Many different forms could be mass produced in factories, and iron beams soon became the standard support for an entire structure. Brick was also mass produced in factories by the use of kilns, instead of having to resort to the ancient method of leaving it in the sun to be dried. Thus, the costs of bricks was reduced and led to their extensive use in buildings. The advent of steam and water powered sawmills also allowed wood to be manufactured in a standard size at large scales. Cheap machine-made nails were also available, and the combination of these two materials provided for a quick and cheap form of shelter in the form of balloon framing (a method of wood construction). The low cost and ease of construction made balloon framing highly attractive, as people no longer requirely highly-skilled carpenters and could build their own buildings without a time-consuming learning curve. This was the answer to America's problem of mass immigration at that time. One predominant factor featured in the construction of shelters in the Contemporary Era. Shelters were no longer simple structures, but were towering high-rise buildings that were usually constructed with either concrete or steel. A major innovation was the development of the steel frame as a structural element. Bricks were still used in buildings, and glass has been used extensively to give the building a modern look and feel. Lightweight concrete also increased the strength of concrete, and the use of pumps to deliver concrete to upper levels meant that concrete could be used in the construction of high-rise buildings as well. Reinforced concrete, where steel rods are combined with concrete, was also developed. The mutlifaceted developments during this period have led to practices that have become the industry standard for the construction of buildings and shelters, and will continue to do so.